Migrants with refugee status who today would get guarantee-pension will be forced to live on social welfare benefit instead, if the proposals from the Centre Party, the Liberals and the New Moderates are implemented. DRW can today, based on the answers provided in the survey, conclude that half of the political parties lack knowledge about living conditions of migrants with non-normative abilities (a.k.a disabled people), exceptions are V, S, KD och F!. C, L and M want to reduce the sickness benefit. When all of the political parties within the Alliance believe they are well informed about the situation for newcomers with non-normative abilities, an uneasy feeling remain in our gut. In spite of, them claiming to protect the right to an independent life and rejecting the ”we and them” attitudes, they want to change and limit the legal framework that gives exceptions for refugees. For example, they want to reduce the sickness benefit for migrants with refugee status in Sweden. Sickness benefit (early retirement) can be paid to persons between the ages of 19 and 64 that are unable to work due to illness, non-normative abilities (a.k.a. impairments) or injury. Those who have had low or no income before the ”early retirement” have a right to a guaranteed benefit of maximum 9.150 SEK per month. An insurance period of 40 years is required for full benefit. The insurance period is calculated from 16 years of age up until the retirement. Today, a person with refugee status can take into account years spent in their homeland and receive full guarantee-pension. The Centre Party, the Liberals and the New Moderates want to abolish this exception to the rule. An article at SVT points out that, a 57-years old person with refugee status that has lived four years in Sweden, and that today get full guarantee benefit of 9.150 SEK per month, will only get 1.120 SEK per month in the Centre Party’s proposal resulting in the person instead having to live on social welfare benefit. The New Moderates wants employment or permanent and legal residency in Sweden to be a pre-condition for full access to Swedish benefits and entitlements, as assistance allowance and disability allowance. Their justification for this is that the system has to be perceived as legitimate by the public. This can be conceived as M believing that the public does not think refugees shall have these rights; therefore, they should be removed. 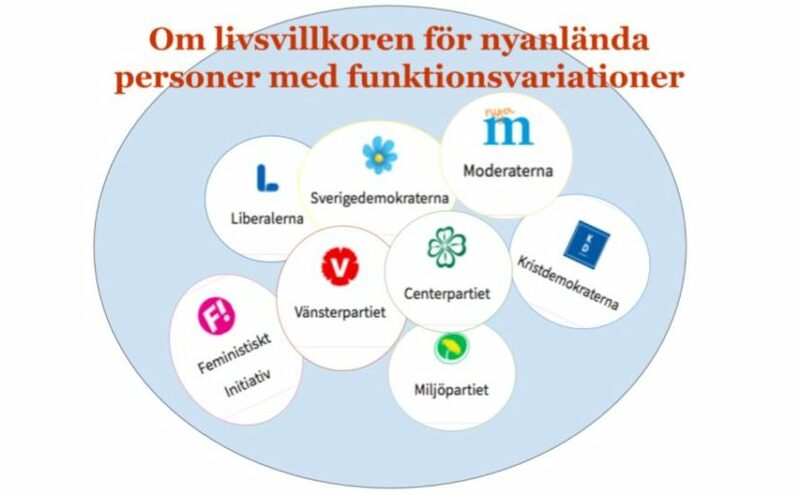 The New Moderates and the Sweden Democrats want to make permanent the temporary migration law, that takes away the right of family reunification for newcomers with non-normative abilities and temporary residence permits. Employment will be a pre-condition for inclusion in the social security system according to all parties within the Alliance. DRW thinks this is an unreasonable and unfair demand, given the current very high unemployment among both migrants and people with non-normative abilities (a.k.a. disabled people) as well as the absence of functioning infrastructure and conditions for migrants with non-normative abilities to access the labour market. The proposal from the New Moderates that, human rights in the form of social insurance benefits be made conditional on employment, is an impossible demand for persons with non-normative abilities that are new in Sweden. Even worse is the Sweden Democrats’ ideas on linking rights to certain benefits to citizenship. At the same time as they claim not to have decided on whether mainly LSS (the law on support and services) shall differentiate between newcomers and Swedish citizens. This creates considerable uncertainty, especially given that SD claims, for example, to want to put a stop to quota refugees and introduce a ”repatriation-billion”. Instead V and F! want to extend rights. The Left Party and Fi talk a lot about the UN Convention on Rights for Persons with Disabilities and the Convention of the Child. As sole parties, they highlight the difference between asylum seekers’ and refugees’ rights to assistance or support. They want to increase the opportunities for asylum seekers to receive support for their non-normative abilities while they await the response to their application. The Social Democrats do not want to differentiate between newcomers and citizens but feel they must. In a panel dialogue during the Almedalen Week on the 4th of July 2018, the Social Democrat’s Anders Kessling, State Secretary to Ylva Johansson, Minister for Employment and Integration said that they rather not differentiate between newcomers and citizens and that they do not support having to qualify into the system, but employment has to be the linchpin. They also say that their outset always has been permanent resident permits and right to family reunification. He said that the enactment of a temporary migration law only was made to restrict the number of migrants arriving at the country. He acknowledged that it was an unpopular decision that did not allow considerations as to how this would affect newcomers from an establishment perspective. Anders Kessling says that non-working cooperation between authorities has meant that many newcomers with non-normative abilities have had to move around and not receive the support necessary for vocational rehabilitation at an early stage. He also says that SFI needs to be re-structured for newcomers with non-normative abilities and that municipalities do not have the right to evict them from their accommodations just because the establishment period is over. DRW is critical to political decisions that often lack a disability rights perspective which is demanded in the UN Convention on Rights for Persons with Disabilities.